Congratulations are in order now that Bill 148, The Fair Workplaces, Better Jobs Act passed into law on Monday, November 27! Your ongoing support has been pivotal in this victory. We have asked for donations in our last few emails, and we thank you for responding so graciously. We hope those who did not have the chance to donate will consider doing so now as the Workers’ Action Centre prepares for the next phase of our organizing, with a focus on enforcing Bill 148 at work. We are up for the challenge of getting out in our communities to provide education to workers about their new rights, and developing effective strategies if employers break the law. The Employment Standards Act now prohibits the misclassification of employees as “independent contractors.” The employer is now responsible for proving that a worker is not an employee. Ending the misclassifying of workers has always been one of the goals of the $15 and Fairness campaign! Under the Occupational Health and Safety Act, employers can no longer require that workers wear footwear with an elevated heel, except in cases where such footwear is needed to ensure safety. On December 3, Critical Illness Leave went up to 17 weeks per year and Parental Leave can now last up to 63 weeks. Many important new protections are to follow starting on January 1, 2018. Most notably, the general minimum wage of $11.60 will increase to $14 per hour! Yet this victory is only the beginning. We know we will have to step up our organizing in order to keep what we’ve won. A provincial election is imminent, and we need to make sure all political parties have $15 and Fairness on their agenda. Workers have already been calling our hotline asking how to deal with employers who are trying to avoid complying with new labour laws. WAC members will be gearing up to amplify outreach to workers about our new rights. Please join us in our organizing by staying tuned and sharing workers’ rights information with other workers! 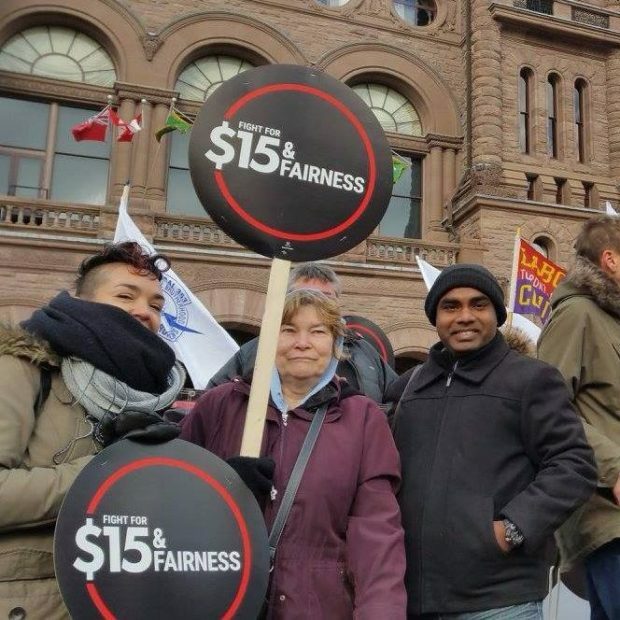 You can also visit 15andFairness.org to find out how you can get involved.